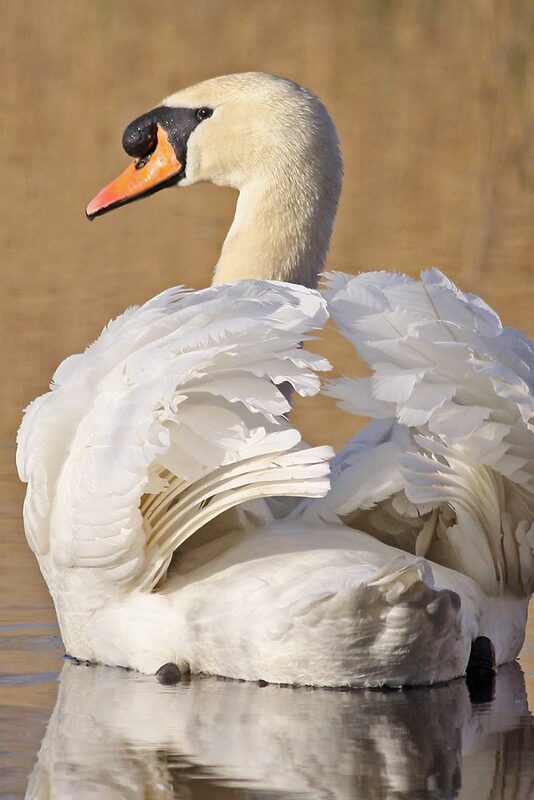 The Mute Swan is one of the most iconic species of swan in the northern hemisphere with its orange bill and black bill knob, known to be of considerable size. Mute Swans are large (length 140-160cm) with adult females weighing around 9.7kg and males 11.9kg (Kear 2005). They have very white plumage with black legs and feet. They are easily identifiable when compared to other northern hemisphere swans such as Bewick’s and Whistling Swans due to the bill colouration. They also have a tendency to arch their wings above their back whilst carrying their neck in a curved position. Cygnets are pale grey in colour, with white under parts. They have black feet and bill, growing into their pinkish-orange bill within the first year. A juvenile will be completely white in full moult during its second summer (Nelson 1976a, 1976b, 1993). Despite their name, Mute Swans are not silent. The adults use a variety of grunts and snorts during courtship and use hisses for aggressive encounters and threat displays. Cygnets have fairly high-pitched peeping noises until they are fully fledged, when their deeper voice emerges. Mutes are very distinguishable due to their unique singing noise produced by their wings in flight. These powerful downbeat sounds occur at a rate of 4 beats per second and are very far-carrying (Kear 1968). Mutes moult their body feathers annually, moulting the wing feathers during 6-8 weeks after the breeding season. This results in flightlessness during summer months. Females tend to moult first and once her flight feathers are fully grown, the male will then moult. Mutes are found from Western Europe to central Asia. European populations tend to be non-migratory but can be locally displaced by cold weather and congregate in large groups after breeding. Introduced populations occur on the east coast of the United States and around the Great Lakes area, extending into Canada (Petrie & Francis 2003). Small populations also occur in South Western Australia and across New Zealand. From: Wetlands International 2016. (1) Wetlands International 2005, (2) Wetlands international 2012, (3) Ward et al. 2005, (4) Kershaw & Cranswick 2003, (5) Shepherd 1993, (6) Scott & Rose 1996, (7) BirdLife International 2004, (8) Yanagisawa et al. 1993, (9) Miyabayashi & Mundkur (1999). Mute Swans use a wide range of shallow lakes and rivers, as well as freshwater and brackish wetlands. In some areas terrestrial habitats such as grasslands and cereal fields may be used. Preferable habitats have a wide variety of aquatic vegetation and terrestrial vegetation consisting of grasses and cereals, especially in late winter when aquatic vegetation is minimal. An adult in moult can require up to 4kg of vegetable matter per day (Mathiasson 1973b). Territorial disputes between pairs can be common. Agreement on the Conservation of African-Eurasian Migratory Waterbirds (AEWA, 2015) Appendix III of the Bern Convention (Council of Europe 1979). 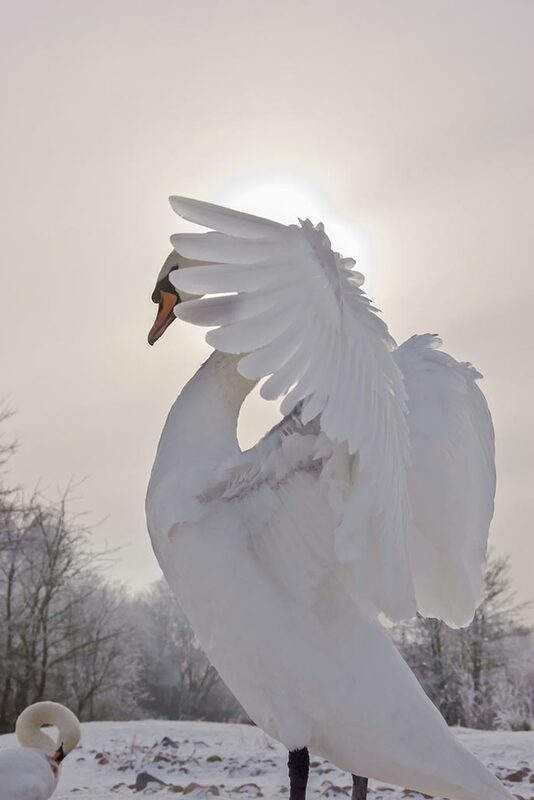 Wildlife and Countryside Act (1981) and The Wild Creatures and Forest Law Act (1971) to safeguard the Queen’s rights of ownership of Swans (Hull Biodiversity Partnership, 2008). BirdLife International (2004). b. Birds in Europe, population estimates, trends and conservation status. Birdlife International, Cambridge, UK. Birdlife Conservation Series 12. Council of Europe (1979). Convention on the Conservation of European Wildlife and Natural Habitats. Available from: https://www.coe.int/en/web/bern-convention [Accessed Feb 2018]. Day, D. D.; Beyer, W. N.; Hoffman, D. J.; Morton, A.; Sileo, L.; Audet, D. J.; Ottinger, M. A. (2003). Toxicity of lead-contaminated sediment to Mute Swans. Archives of Environmental Contamination and Toxicology 44: 510-522.
del Hoyo, J.; Elliot, A.; Sargatal, J. (1992). Handbook of the Birds of the World, vol. 1: Ostrich to Ducks. Lynx Edicions, Barcelona, Spain. del Hoyo, J., Collar, N.J., Christie, D.A., Elliott, A. and Fishpool, L.D.C. (2014). HBW and BirdLife International Illustrated Checklist of the Birds of the World. Lynx Edicions and BirdLife International. Kear, J. (2005). Ducks, geese and swans volume 1: general chapters; species accounts (Anhima to Salvadorina). Oxford University Press, Oxford, U.K.
Kelly, A.; Kelly, S. (2004). Fishing tackle injury and blood lead levels in Mute Swans. Waterbirds 27(1): 60-68. Kershaw, M. and Cranswick, P.A. (2003). Numbers of wintering waterbirds in Great Britain 1994/95-1998/99: I. Wildfowl and selected waterbirds. Biological Conservation 111: pp.91-104. Melville, D. S.; Shortridge, K. F. (2006). Migratory waterbirds and avian influenza in the East Asian-Australasian Flyway with particular reference to the 2003-2004 H5N1 outbreak. In: Boere, G.; Galbraith, C., Stroud, D. (ed. ), Waterbirds around the world, pp. 432-438. The Stationary Office, Edinburgh, UK. Miyabayashi, Y. and Mundkur, T. (1999). Atlas of the Key Sites for Anatidae in the East Asian Flyway. Wetlands International, Tokyo, Japan, and Wetlands International Asia Pacific, Kuala Lumpur. pp.148. Nagy, A.; Machova, J.; Hornickova, J.; Tomci, M.; Nagl, I.; Horyna, B.; Holko, I. (2007). 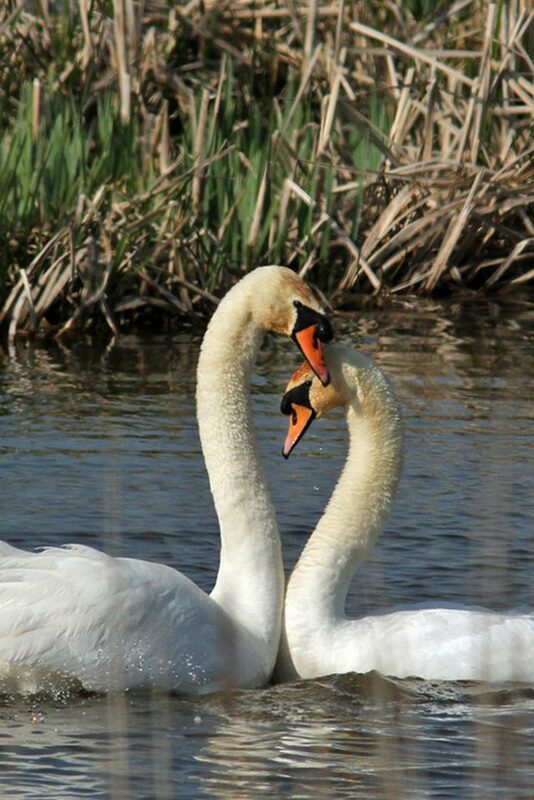 Highly pathogenic avian influenza virus subtype H5N1 in Mute swans in the Czech Republic. Vetinary Microbiology 120: 9-16. Scott, D.A. and Rose, P.M. (1996). Atlas of Anatidae populations in Africa and western Eurasia. Wetlands International Publication 41. Wetlands International, Wageningen, NL. pp.336. Shepherd, R. (1993). Ireland’s Wetland Wealth: the birdlife of the estuaries, lakes, rivers, bogs and torloughs of Ireland. The report of the winter wetlands survey 1984/85-1986/87. Irish Wildbird Conservancy, Dublin, Eire. Spray, C. J.; Milne, H. (1988). 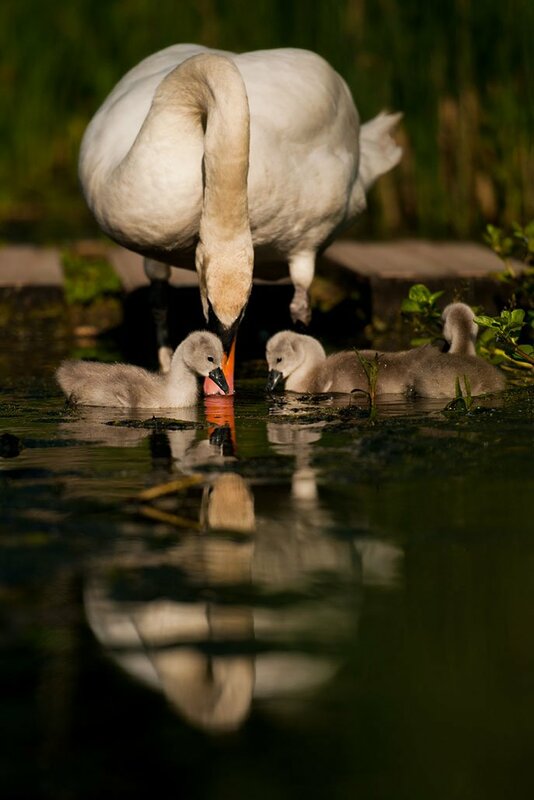 The incidence of lead poisoning among whooper and mute swans Cygnus cygnus and C. olor in Scotland. Biological Conservation 44: 265-281. Ward, R.M., Cranswick, P., Kershaw, M., Austin, G. et al. (2005). Results of National Mute Swan Census 2002. Wildfowl and Wetlands Trust, Slimbridge, UK. Wetlands International (2005). International Waterbird Cencus, Unpublished data. Wetlands international (2012). Results of trend analysis undertaken for CSR5 2012. Wetlands International (2016). Waterbird Population Estimates. Available from: wpe.wetlands.org [Accessed Feb 2018]. Yanagisawa, N., Fujimaki, Y. and Higuchi, H. (1993). Japanese data on waterbird population sizes. Summarised for IWRB.